The A in ALW is for Amy. The L and the W? Ask me if you see me at a workshop or exhibition. Based in Sydney but born in England, my art focuses on mental health and wellbeing. Like anyone who’s experienced mental health issues, it doesn't define me. But it does provide a touchstone for my watercolour prints, illustrations for business, workshops and commissioned works. I was a born artist, but a few years ago my creativity had stalled. My outlet was video game and ad agency work – not the best environments for an artist heart. When my son was born in 2015, Postnatal Depression (PND) and anxiety arrived with him. I’m lucky, I got support from a psychologist through The Gidget Foundation. My art was a lifeline. Self-taught, I started experimenting with mandalas and illustrations, and my muse was sparked. Far from closing in my world, my mental health issues and treatment opened up a new creative existence, and the confidence to share it with the world through exhibitions, workshops and artistic works. What began as therapeutic has become a vocation. I’m compelled to draw in pen and ink, paint in watercolours and experiment with digital design and technology. My art inspires conversations about mental health, the complexities of being human, and the power of the mind. I share it through meaningful prints for your home, commissioned works, commercial illustration and artistic workshops. I’m proud to say I inspire myself. Looking for new ways to share my art and start a conversation about mental health, a range of greeting cards was born. The illustrations can speak 1000 words if you don't know how to help someone doing it tough or dealing with a mental health issue. Designing mandalas, (spiritual symbols in Hinduism and Buddhism expressed as circular illustrations), sparked my own creative odyssey. I love to share this skill with others through my Mindful Mandala workshops. 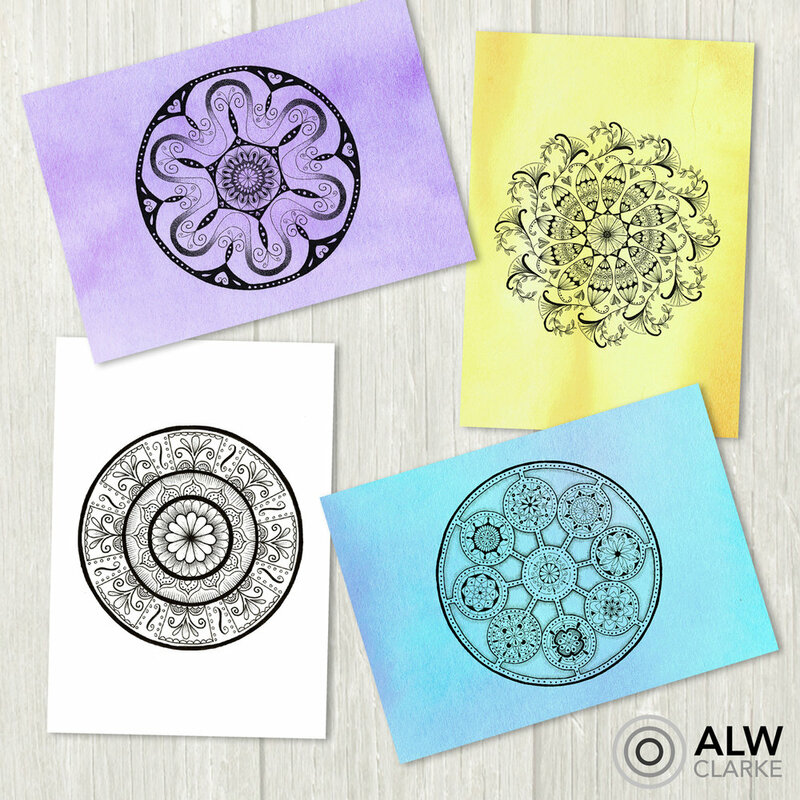 The mandala design process encourages reflection and growth, and gives me the chance to encourage good mental health practices and personal wellbeing in others. Ooh, and a secret about mandalas? They’re loads of fun! I’m lucky to have an outlet to share my experience with others. Getting help was the fork in the road, so each month I donate a day’s work to a charity doing good in the world. So far, I’ve supported the Dragons Abreast Conference, Annie’s Auction, the Taronga Zoo Expresso Yourself Exhibition, Manly Women’s Shelter and the Gidget Foundation. The world needs us all to bring joy to it. I bring mine through mindful art. How do you bring yours? 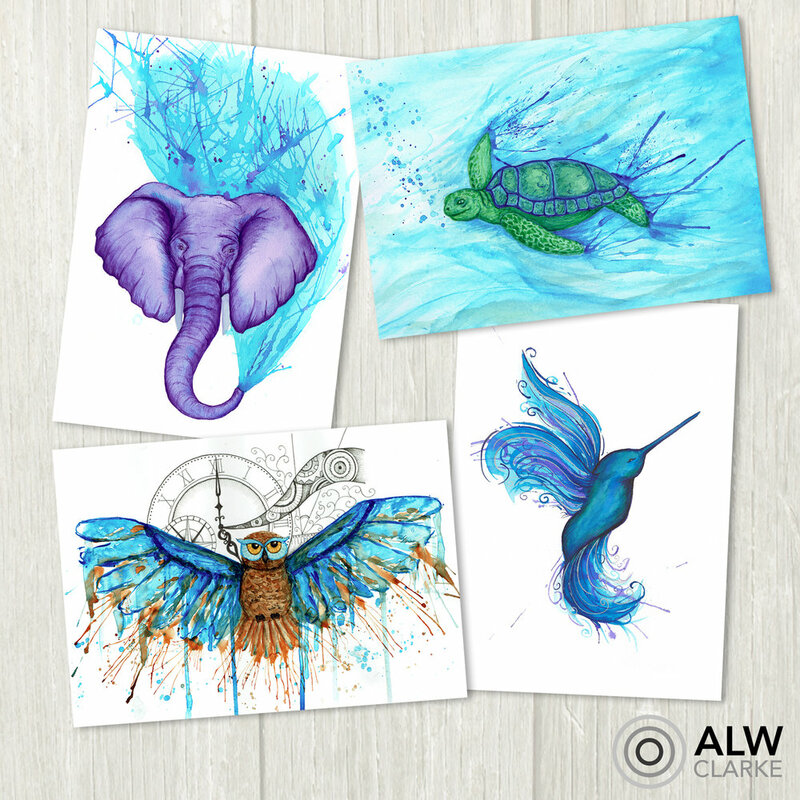 ALW Clarke works with pen, ink, paper, canvas and watercolours to create commissioned works, prints, mindful greeting cards, and illustrations for brands and businesses. Amy’s abstract, surreal and mandala works explore psychology, the human condition, animal symbolism, and the complexity of depression and anxiety. She loves to learn and experiment with digital design and new mediums. Inspired by a journey from post-natal depression to support and recovery, she is an advocate for self-care and mental health awareness, who believes it’s never weak to speak up. Amy lives in Sydney with her family. When she’s not drawing, painting, or thinking about drawing and painting, she spends time enjoying nature and planning an honest book about parenting.